The company’s current General Manager took over the manufacturing company from his father Anton Buchele in 1994. Posamenten-Müller has been owned by the family since 1980. Andreas Buchele is continuing the traditional craft and even in the 21st Century places great value on the high standard of quality of the products his company makes. 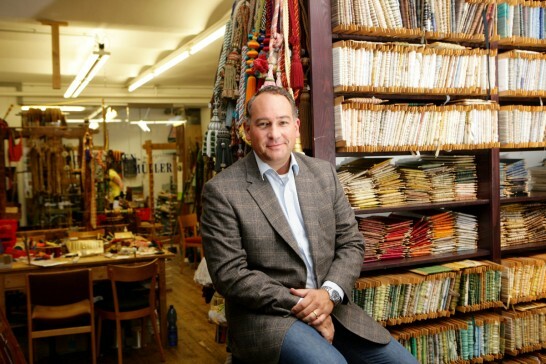 Some customers can scarcely hide their fascinated amazement at hand-twisted cords and ropes or woven braids – the trained interior designer is aware he is running one of the last stores of its kind, and is more than proud of it. 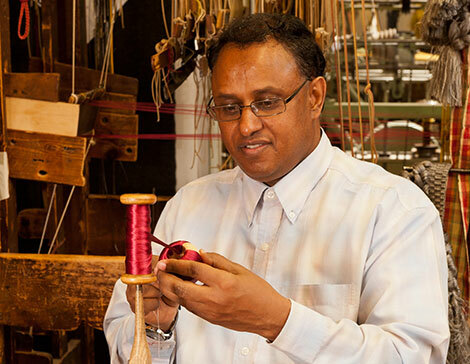 The trained weaver has been working at Posamenten-Müller since 1996. It was here that Simone Howe really started working by hand. 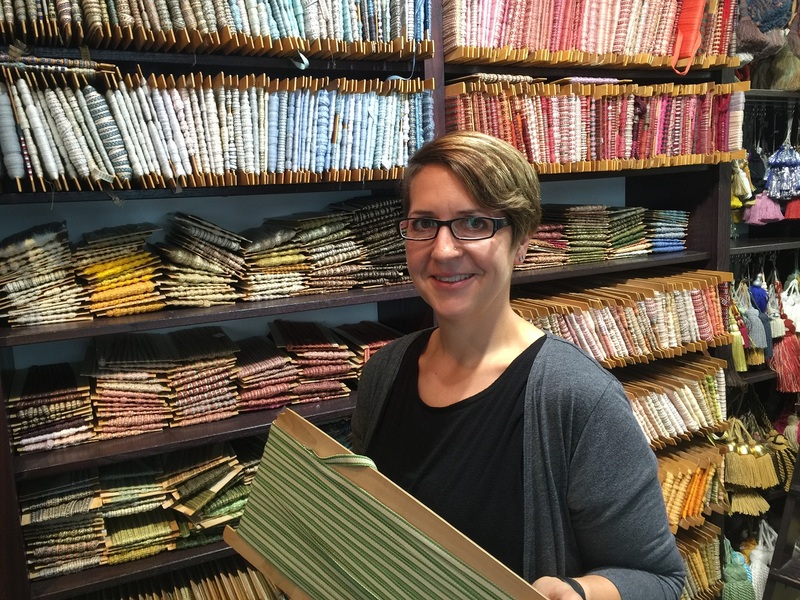 Today, her skills and experience come into use in all areas of the factory: In rope-making, hand and machine weaving as well as in pure needle work – Simone Howe is an experienced professional. However her strengths also include colour design as well as the design and development of weaving cards for the Jacquard loom. Since she feels at home in all areas of the passement craft and always can accurately assess whether and how specific requirements can best be implemented, she enjoys personally looking after the customers and gives tours of the workshop to interested groups. Tuku Salh came into the passement craft as a complete beginner; he actually wanted to become a prosthetist. He has been part of the team at the traditional company in Munich since 1996 and today at Posamenten-Müller he is primarily responsible for sewing. In practised, careful hand movements he creates tassels and tassel fringes, manufactures buttons and fasteners or produces technical passements, which, for example, are used in the automobile industry. 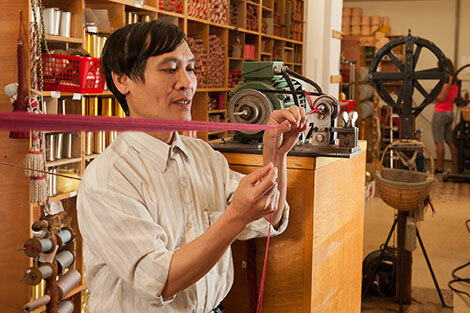 Pham Tuan Long has worked for Posamenten-Müller for over 20 years: His area of expertise includes, above all, rope making, which is twisted and spun into handrails, ropes, cords and laces. In addition, his work also includes preparation for the weaving and sewing department. Pham Tuan Long has also changed his career. He had, however, already worked with textiles in the field of men’s clothing before he joined Posamenten-Müller. At the factory he can brilliantly combine his imagination and creativity with his craftsmanship and love of textiles. Between 1981 and 1984 Doris Roth did her apprenticeship at Posamenten-Müller. She has been employed at the factory ever since. As well as sales and advice, Doris Roth is dedicated to sewing with a lot of imagination and passion. Whether reconstructions of historic buttons, decorative flowers or other elements: Thanks to her experience Doris Roth successfully completes even the most delicate work accurately and in accordance with the thread from the original. Her expertise also includes tassels and fringes as well as the the making of jewellery and the incorporation of external elements such as Swarovski Crystals in certain passements. 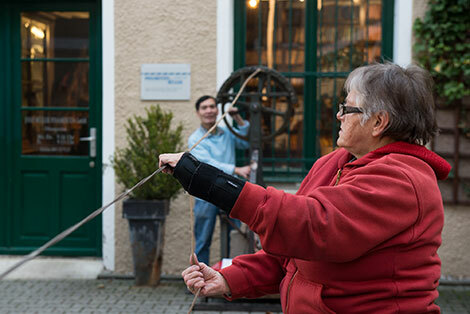 She started her work at Posamenten-Müller in the rope twisting hall. 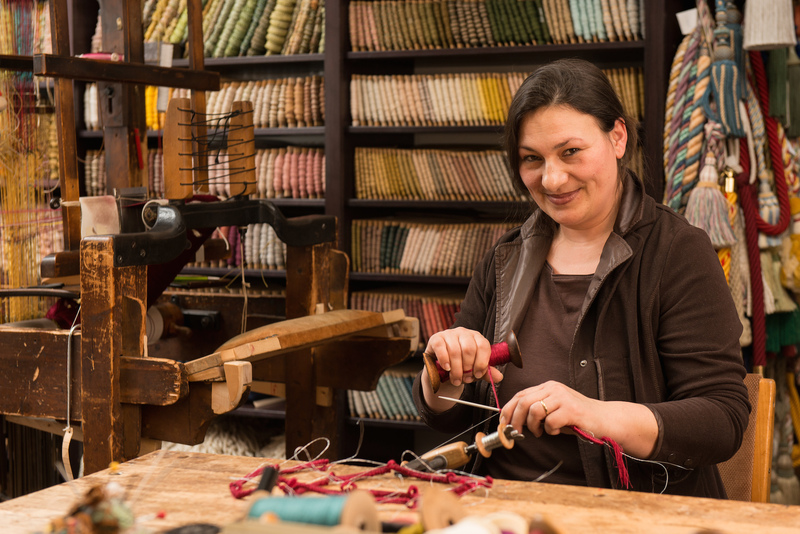 Svetlana Erceg joined the traditional company in 1988 and since then has mainly worked in the ropeworks. Since then she has developed into a real specialist in this field. In addition, together with rope making, where she can implement nearly all customer requests from hand rails to menu lacing, the experienced employee is also involved in sewing. Here her responsibilities include preparation for tassel manufacture and producing technical passements. Paula Huber has worked for the factory in the heart of Munich since 1981. As well as rope making, her specialisms primarily include machine weaving. Here, she always keeps track the big machines in the back room of the factory, on each of which several small shuttles dart back and forth at lightning speed weaving up to four braids at the same time. At Posamenten-Müller Paula Huber also runs the card punching for the Jacquard looms as well as the lace making which is primarily used for lamp ropes.